Back pain is a special kind of pain- a literal pain in the neck. For some, it comes and goes, and for others it is a chronic reminder of the challenges they face. We understand how your back and neck affect everything you do. 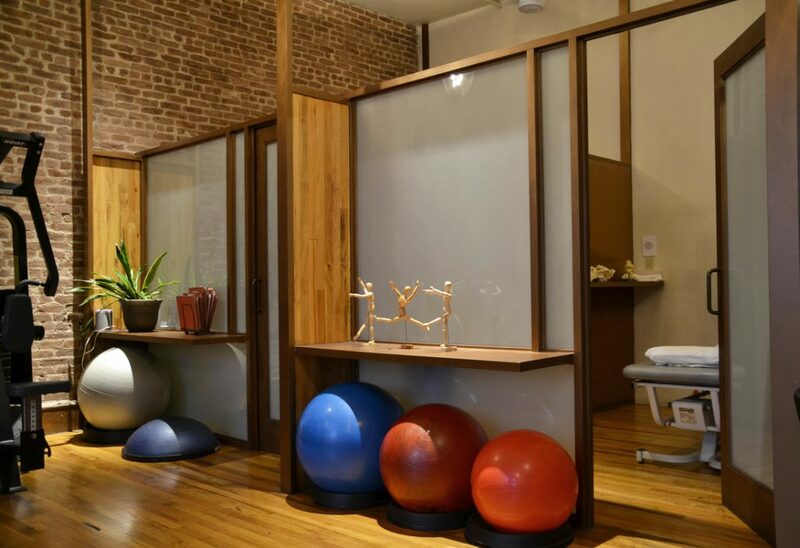 Our therapists place special emphasis on improving your mobility and minimizing your pain. We welcome you when you need us. About 13 million Americans see a doctor for back pain every year. As sitting is the new smoking, posture is becoming even more important- particularly with the rise in computer and mobile device use. Without proper alignment, muscular imbalances can lead to tightness that eventually limits both tissue and joint mobility. ​At James Fowler Physical Therapy, you can trust our experienced therapists to identify and address the structural and stability deficits causing your pain. We consider the individual interests and demands on every patient, educating each on how to manage their bodies for their own lifestyle. Following the latest treatment methodologies, we are fully equipped to help you heal, strengthen, and stabilize your spine. This page outlines many of the conditions we treat, but by no means is it all-inclusive. If you do not see your specific problem, please get in touch with us. Keep scrolling to see more detail about how we can help you. Back and neck pain have always been concerns for most Americans, but the rise of technology has caused most of us to feel the hurt far younger than we anticipated. “Text neck” is a relatively new phenomenon, yet it is becoming common among people in the 20s, 30s, and 40s. Traditional injury and chronic conditions are ever present. Thankfully, our team of therapists – physical therapists, massage therapists, and movement analysis – have ample experience in these areas. When treating arthritis in the back and neck we have three goals: Improve mobility in the the joints, reduce pain levels and most importantly stopping further progression of joint damage. Through a tailored strengthening and stretching program, we focus on corrective exercises to improve symptoms and help you understand how to properly move to avoid irritation of the area. Core dysfunction is far more common than we realize causing a range of problems. From Muscular tears, pelvic floor pain, low back pain, surgeries and birth, we work with patients to educate them about alignment, posture and basic ergonomic stance to efficiently reduce pain. A detailed exercise program is created in conjunction to strengthen, stabilize and correct muscular imbalances. Modalites may be incorporated if needed to manage pain as well. Degenerative disc disease has a multi faceted approach and we approach in a wholesome way through passive and active treatments. Our physical therapists will perform a variety of manual therapy treatments and techniques. Focusing to assess posture, walking mechanics and daily activities our goal is to provide the patient with necessary changes and adjustment to improve symptoms. Along with our team of trainers, JFPT works to strengthen the core and get the patient on track for long term pain relief and recovery. At James Fowler physical therapy we treat disc herniations on a case by case basis through the McKenzie Method. Each herniation is different and symptoms vary depending on the type of herniation. We focus on the individual’s, sensitivity and symptoms to control them and work on alignment, strength and mobility. Deep tissue massage therapy is an effective pain reliever that we partner with hot and cold therapy and strengthening/mobility exercises. Facet syndrome, also known as osteoarthritis is treated at James Fowler PT by educating the patient about their condition, reducing lumbar lordosis and providing stability to the spine through core and pelvis stabilizing exercises. A comprehensive exercises program to address muscle imbalances is needed to to ensure rehabilitation is prompt. Along with muscular reeducation, soft tissue manipulations are utilized to help address symptoms. Ligament Tears can vary in severity. It is important to rest and protect the ligament while it heals. At James Fowler PT we focus on stability of the surround musculature while the injury repairs itself. Mobility of the affected joint is key to prevent future re- injury, thus a comprehensive protocol is created by our team to ensure the patients is well equipped to return to full function. When treating a muscle tear or strain it’s important to treat the body as a whole. Over stressing or imbalance of musculature creates a ripple effect down the chain to other musculature. A combination of open chain and closed chain exercises is utilized to emphases proper biomechanics, stability and mobility to the affected area. Modalities as well a s soft tissue work is used to work on swelling and tightness and help control symptoms while the body heals. Treating repetitive strain injury starts with understanding how the injury was caused. Typically, poor posture, high intensity workouts with no rest, and generally repetitive activities are at fault. Understanding posture and proper biomechanics can make a huge difference to keep you from continuing to irritate the same area. Along with modifying the contributing factors, our team at JFPT will create a protocol of straightening and corrective exercises to ensure proper healing and prevent further episodes. Myofascial pain syndrome treatment is a layered treatment process. We start the process by locating the origin of the problem to ensure your fascia and muscles do not continued to be stressed. A combination of manual therapy, strengthening and stretching is crafted to relieve pain and correct range of motion and stability. In addition, modalities may be utilized to help control symptoms while the body continues to heal. Our team at James Fowler Pt will evaluate the affected nerve area and perform manual therapy to help relieve pressure from the nerve. A combination of stretches and nerve glides will help relieve symptoms to allow for the area to remain pain free. In addition, a proper muscular re-education program is created to prevent future episodes. Each surgery is different and it is important that the rehabilitation is tailored to target healing accordingly. At JFPT, we work in collaboration with the surgical team to develop a custom protocol to help facilitate appropriate healing. Following post surgical protocols our team of trainer and therapist will work together to facilitate mobility and stability to the affected area. Taking past injuries into account, our therapists will assess the patient’s resting posture and work with the patient tailoring treatments guided by the patient’s activities, lifestyle, work. In conjunction with our team of trainers, each patient will be prescribed an exercises program to prevent posture from deteriorating in the future. At James Fowler PT we employ a mixture manual therapy and strengthening exercises to alleviate sciatica symptoms. The main focus is on relieving pressure off of the sciatic nerve while learning how stabilize the lumbar spine and the pelvis correctly. Physical therapy for scoliosis is an effective way to better posture and alignment as well as muscular imbalances. We treat scoliosis in a holistic fashion that includes a mixture of mirror-image exercises, neuro re-education, and strengthening of deficient areas in the spine. Our team at JFPT is equipped to apply a range of manual soft tissue work in relation to a comprehensive exercise program to improve posture and symptoms. We treat spondylolisthesis through exercise therapy and strengthening. By increasing strength and stability in the deep abdominal musculature and the posterior chain of the lower extremities, we can ensure that the vertebrae remain safe from further episodes. We also create a strengthening and stretching program for home and office to improve overall posture. In relationship to sports technique and rehabilitation, neck and back pain is a multi-faceted condition affected by a range of variables. We treat each condition through a comprehensive approach taking into account the patient’s medical history, daily routine and over all biomechanical and postural stance. Our team of therapists will focus on breaking down technique, corrective exercises and manual therapy to improve range of motion, stability and endurance.